New Zealand‘s Waitomo Caves are a little different than your average cavern. 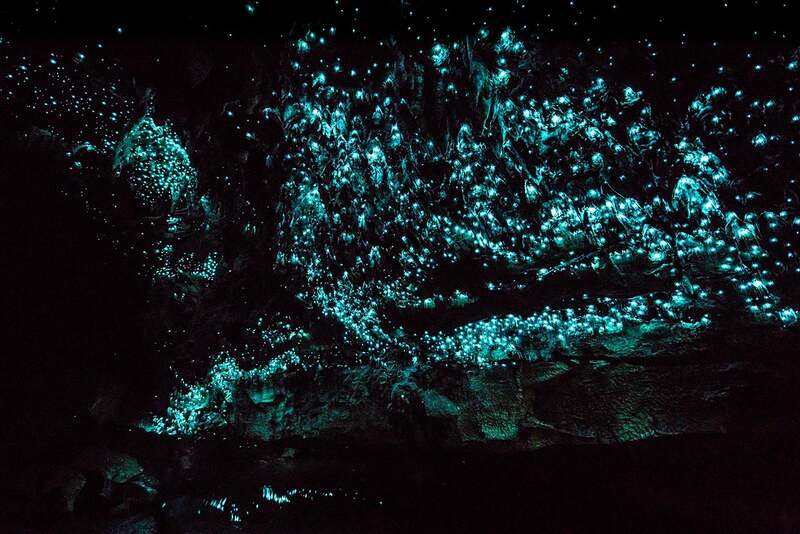 Formed by limestone with a maze of underground rivers and sinkholes, the caves are filled with thousands of glowworms that dangle from the ceiling and sides. They radiate a warm glow that illuminates the the whole cave. This particular glowworm species can’t be spotted just anywhere — the Arachnocampa luminosa only exists in New Zealand. A guided visit to the cave starts with a stop at the Visitor’s Center, followed by a walk through the Catacombs and the Tomo — a 50-foot shaft of limestone — and then down to the Banquet Chamber, where you may be able to see a towering limestone formation called the Pipe Organ (this is sometimes closed to the public because of carbon monoxide buildup). You’ll end up at the Cathedral, a platform known for its acoustics — performers have actually held concerts here! Finally, you’ll get to see the glowworm grotto by cruising in a boat along the subterranean Waitomo River. The only source of light here is the radiant light produced by the glowworms. Today, the caves are partially owned by the the local Māori tribes who participate in their upkeep, management and development. The Waitomo Caves are located 125 miles away from New Zealand’s largest city, Auckland. You can hire transport or rent a car to get to the caves from the city. From the United States, you can fly nonstop to Auckland (AKL) with Air New Zealand (voted the world’s top airline in 2017) from San Francisco (SFO), Houston (IAH), Los Angeles (LAX) and Honolulu (HNL). Hawaiian Airlines also flies nonstop from Honolulu. Although United wasn’t voted the world’s top airline, if you can manage to find Saver award availability, you could potentially get to Auckland and back for just 80,000 United MileagePlus miles in economy.